So lately I’ve been branching out. First I started experimenting with other dense breads, using zuchini instead of oil. I filled these heavy loafs with rosemary or thyme, making them savory and always so heavy that a single slice constituted a meal. As lovely as these loafs were I wanted to mimic the artisan rounds going for $5.00 in the bakery. So I started doing my research and looking at what makes bread Bread. 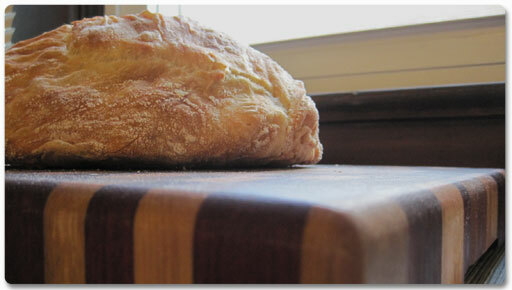 So I researched my gluten, got the right supplies, and whipped up a batch of supremely awesome bread last week. A few of my friends have been experimenting with bread and pointed me to this No-Knead Bread recipe in The New York Times online. It’s phenomenally easy and pretty much the best thing ever. It’s just like a fresh loaf of artisan bread from the bakery shelf. Except I made it. All it takes is patience. Follow the recipe exactly and you’ll have success. The only advice I might offer is not to be alarmed when you open the Dutch Oven to find a rock hard loaf. Once it begins to cool on a cooling rack, the elasticity returns to the crust. In addition to this excellent recipe, I stumbled upon a good way to use the explosion of fresh tomatoes that continues in our garden. Slow roasting. Mix some garlic with olive oil and brush over slices of tomatoes on a parchment-lined baking sheet. Slow roast for about 5 hours at 200 degrees, depending on the thickness of your slices. Ours were between 1/8 and a 1/4 inch. My only suggestion here is to keep an eye on them for the last couple of hours instead of going over to a friend’s house and having a long dinner. Because when you come home you might find tomato discs instead. Fragrant, but not so much edible.